One of Sri Lanka’s fastest growing finance companies, Kanrich Finance Ltd. has launched a unique Corporate Social Responsibility program to provide drinking water facilities to a rural school in Batticaloa. 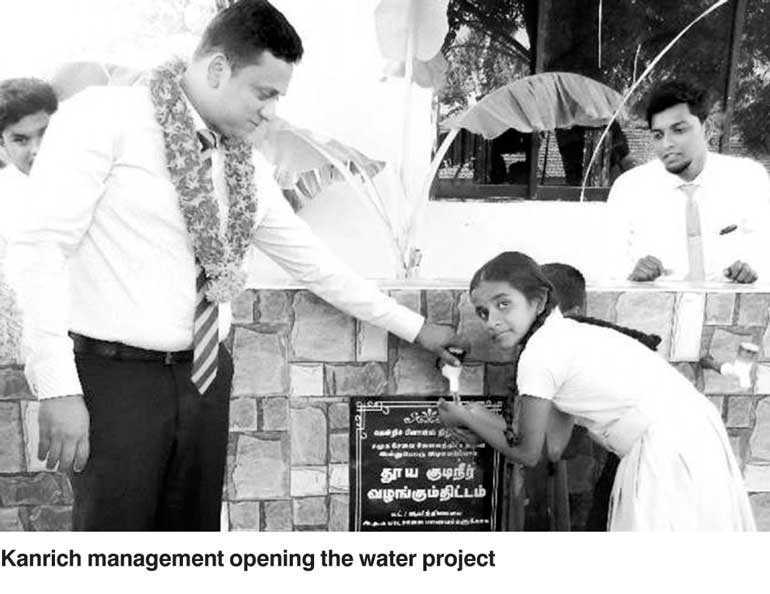 Under the guidance of Chief Executive Officer Shiran Weerasinghe and the senior management, the third phase of Kanrich Finance Drinking Water Project took place in Aithamale Tamil Vidyalaya recently. Without access to clean and safe water, education is almost impossible. Unclean water leads to a cycle of disease, missed school days. As a solution for this Kanrich Finance Ltd. has offered a water supply unit to Aithamle Vidayalaya to unlock the potential of every student by helping them stay healthy and freeing them to remain in class. The opening of this project was graced by Kanrich Finance Ltd. Chief Executive Officer Shiran Weerasinghe, General Manager Eranda Amal Godage, Deputy General Manager Pradeep Basnayake, Head of CSR Manoj Waariyagoda, Zone Head Jagath Gamage, Public Health Inspector of Aithamale and the Principal of Aithamale Tamil Vidyalaya B.P. Princely. Teachers, students and the employees of Kanrich Finance Ltd. also participated at this special occasion. Kanrich Finance Ltd. has won the people’s trust over 45 years as a reliable and trusted financial institution in Sri Lanka. As a licensed financial institute with the Central Bank of Sri Lanka Kanrich Finance has repeatedly proven its trusted excellence as a pioneer in the Sri Lankan financial sector.